If you’ve been following the Humphrey Chronicles, you know that Amelia just hasn’t been inclined to roll. It never seemed to bother her much, but Mom and Dad (stupidly) just couldn’t wait for it to happen. Well Tuesday, she really figured things out for the first time. Now, it’s like she’s discoved a whole new world. All she wants to do is roll. Put her down and she wants to roll. 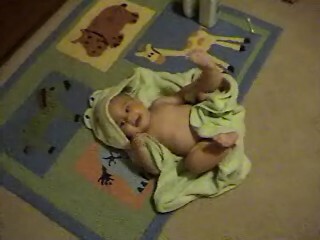 Changing a diaper, what better time to roll than when you can get poop everywhere? Amelia isn’t the only thing that’s been rolling. The video camera has also been busy shooting footage lately. Thanks mostly to Beth learning how to operate it….well, she’s still learning as you will see….have some funny footage of her devouring her juice from a sippy cup and playing in her crib instead of napping. We also have a sequence capturing the night time routine we’ve been doing with Amelia since she was two months old.